Research activities about playful ways to experience construction supply chain optimizations have been published in the ASCE Journal of Construction Engineering and Management, volume 143 (issue 11). To provide new opportunities for acquiring experience in coordinating construction supply chain activities, this paper describes a serious gaming approach. Serious games offer their users an experience that is designed to be meaningful. Following the triadic game design approach, the authors designed a board game that challenges a player to design and construct a skyscraper called Tower of Infinity. The research aim was to explore how serious games (like this one) can contribute to the experiential acquisition of construction supply chain management knowledge. Game sessions were organized in which 64 construction management students played the board game and reflected on it in a written report. A content analysis of these reports was then conducted to assess three hypotheses. Based on that analysis, it is concluded that serious games can enable students to experientially learn how to improve the performance of a construction supply chain through (1) co-ordinating design and construction tasks in a coherent manner; (2) taking constructability aspects into account when designing; and (3) continuously balancing scope, time, and cost throughout a project. 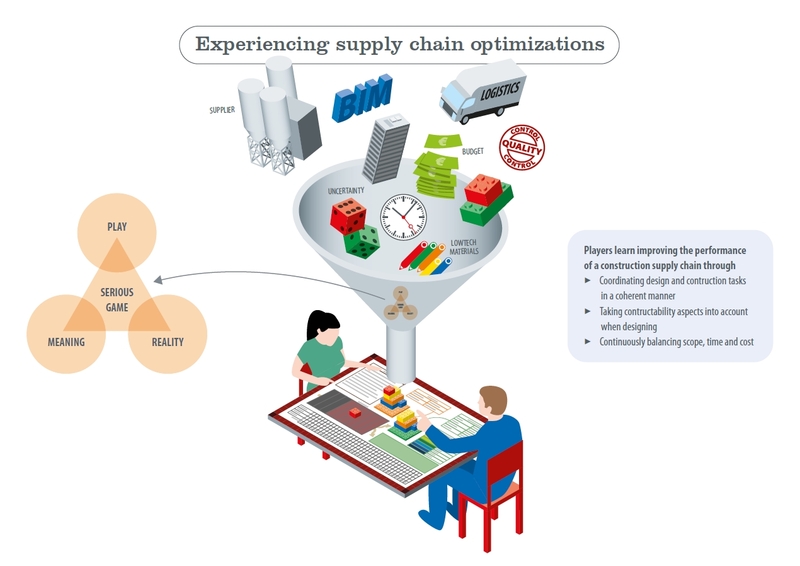 Experiencing supply chain optimizations in such a playful way promotes better understanding of how and why waste occurs and may, ultimately, contribute to more efficient construction supply chain management practices. van den Berg, M., Voordijk, H., Adriaanse, A., & Hartmann, T. (2017). Experiencing Supply Chain Optimizations: A Serious Gaming Approach. Journal of Construction Engineering and Management, 143(11), 1-14. Read the full article in the Journal of Construction Engineering and Management.